Age-related changes to the musculoskeletal and neurological systems can predispose older adults to a greater fall risk than their younger counterparts. This multifaceted nature of sensory and motor degradation raises the question: how do older adults responses to destabilizing events, such as slips and trips, differ from healthy younger individuals? We tested this by perturbing older and young adults during gait initiation, the transition between quiet stance and dynamic gait. It is well described that transitional movements are more difficult for older adults due to greater postural demands. We predicted that older adults would have greater difficulty recovering from the destabilizing event and that this would result in a greater risk for future falls. We hope that the resultant information could be used to inform fall prevention strategies aimed at reducing high risk postural responses. To simulate real-world slips and trips, we utilized a robotic moving platform to deliver perturbations. The platform motion occurred as the participant initiated a step, during push-off, similar to a real-world slip on a low friction surface. This motion was known to cause a destabilizing event, however not strong enough to cause a fall. Perturbations occurred in random to the left, right, backward, and forward directions, making them unpredictable to the participant. Motion tracking equipment was utilized to recreate a 3D model of participant responses. For simplicity, only results from mediolateral (left/right) perturbations will be discussed. Following mediolateral perturbations, we observed significant differences in the stepping patterns of older adults relative to young adult participants. On average older adults took shorter, narrower, and quicker steps than the younger adults. As a result, these altered step patterns demonstrated by older adults required more steps to return to forward motion. This strategy is concerning, as taking a series of small steps is associated with a higher risk for falls. This rapid reaction may not provide as much ‘stability’ as the coordinated postural response observed in the younger adults. Future research should aim to determine if these responses can be modulated through exercise intervention or training paradigms specific to a robotic platform. This research could provide a proactive falls prevention intervention aimed to improve reactionary balance when older adults are faced with a destabilizing trip or slip. However, further knowledge is needed to determine if the skills learnt on a perturbation platform are transferable to a real-world slip or trip. 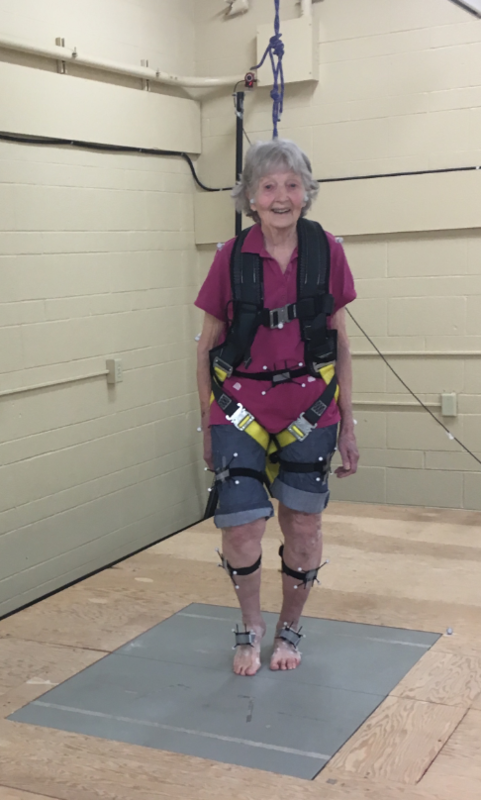 Figure 1: Older adult participant initiating gait on the robotic platform. 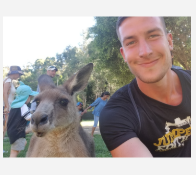 Working as a physiotherapy assistant and fitness instructor gave David a passion for working with an aging population. He felt like he was improving lives, and the interactions he shared were always genuine and comforting. This background naturally transitioned him into the research world, studying balance changes in aging with Dr. Vallis.